Secretary of State John Kerry strongly suggested in remarks on Monday that President Obama has concluded that the ruling Baath regime in Syria was responsible for poison gas attacks last Wednesday that reportedly left hundreds dead, including non-combatant women and children. He further suggested that the Obama administration intended to respond in some way to this alleged regime atrocity. 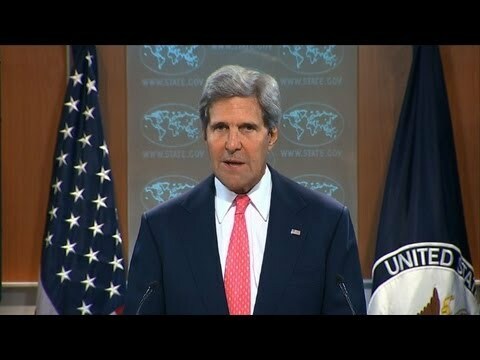 Kerry instanced the reports of the Doctors without Borders organization that operates in 3 Damascus-area hospitals. Note that it is not as conclusive as Kerry suggested, though it is very suggestive. Some have asked why the regime would risk using poison gas when it has been making gains against the rebels. But the regime’s advances are minor and tenuous. It only took the small town of Qusayr with Hizbullah help! And ‘advances’ in Homs were just scorched earth destruction of neighborhoods. They were offset by loss of a major air base near Aleppo, key for resupply of troops up there because roads north are insecure. The regime can only advance here or there, but doesn’t have manpower to take back substantial territory. My guess is that rebels in Rif Dimashq in outskirts of the capital were making inroads toward Damascus itself. Defensive troops are off tied down in Homs. Since the capital is the real prize and end game, the regime decided to let them know it wouldn’t be allowed. It is the typical behavior of a weak regime facing superior demographic forces (the Alawites are far outnumbered by Sunnis) to deploy unconventional weaponry. Although there was a risk in using the gas, the regime may have felt threatened enough to take the risk, confident that it could muddy the waters afterwards with charges that it was actually the rebels who were behind it. I don’t find the ‘false flag’ narrative about the gas attack put forward by the Russians plausible. Rebel forces are not disciplined enough to be sure of being able to plot and carry out a mass murder of the families that have been sheltering them in East and West Ghouta and to keep it secret. How could they have been sure no one among them would get cold feet and blow the whistle? Killing hundreds of women and children from your own clans would be objectionable to at least some in any group of fighters. The fighters in Rif Dimashq are not the hardened Jabhat al-Nusra types. Besides, capturing and deploying rocket systems tipped with poison gas is not so easy; even just operating them takes training. It is not clear what an American intervention would achieve. It is likely that Washington will conduct a limited punitive operation, perhaps hitting regime buildings with Tomahawk missiles. The latter would avoid the regime’s sophisticated anti-aircraft systems, which might be able to fell an F-18 fighter jet. It should be obvious, however, that any such strike would be a form of retaliation for President al-Assad’s flouting of international law. It would not actually protect Syrians from their government, and it would be unlikely to alter the course of the civil war. Such a strike would carry with it some dangers for the US. It is not impossible that the Baath would respond by targeting US government facilities or businesses in the region. It is also possible that it would target Israel in revenge. An American strike might bring the Iranian Revolutionary Guards into Syria in greater forces. But it is also possible that the regime will hunker down and concentrate on surviving its domestic challenge. Either way, the people of Homs and other contested cities will likely go on suffering the regime’s indiscriminate assaults, and it is unlikely that a few Tomahawk strikes will affect the course of the war.